Documentation of my participation in the De Appel Curatorial Programme 2018/19. My participation in the programme has been assisted by the Australian Government through the Australia Council for the Arts, its arts funding and advisory body, and by the following Pozible supporters: Abdul-rahman Abdullah, Amir Barber-Skwarko, Claire Bushby, Claire Coleman, Gemma Devenish, Jake Duffield, Tristan Fidler, Scott Gerring, Jenni Gray, Lisa Green, Alex Griffin, Lee Harrop, Miranda Johansen, Miko Katze, Dan Kus, Pilar Mata Dupont, Senán Mac Conchradha, Danni McGrath, Melissa McGrath, Sabina Moncrieff, Helen Seiver, Desmond Tan, and Alina Tang. So Long and Thanks for All The Fish is an attempt to present the complex and variable experience of place. The artists in this exhibition grew up in Bunbury (or near to it), but no longer live here. Their art speaks of history, nostalgia, family and social connection, reflecting a vision of Bunbury’s identity that is connected, layered, and evolving. In the 1960s, Evelyn Smith began feeding dolphins from a small jetty near her home on the Leschenault Inlet. She continued this until her death in the early 70s. In 1989, a dolphin specialist was hired by the newly established Bunbury Dolphin Trust to study the local dolphins and scope the feasibility for dolphin-human interaction. From this work came the establishment of the Interaction Zone in Koombana Bay 1990 and the opening of the Dolphin Discovery Centre in 1994. Dolphins have become a large part of the civic identity of Bunbury. They are a major tourism draw and are equally embraced by locals, with dolphin emblems scattered across the businesses and homes of Bunbury. This type of peculiarity is what people often think of when they envision what defines a place. They are endearing eccentricities that earn a community a footnote in tourist guidebooks. Building community identity around eccentricities and anomalies of legend ties a place inevitably to its past, almost as if only one thing of note has ever happened there. The events become decontextualised from larger patterns of history, politics and culture - a perspective that decontextualizes regional cities themselves. The story of Evelyn Smith and Bunbury’s connection to dolphins seems to be something unique and isolated, but it is woven into the social and political fabric of history. There are ways we can interrogate the story: what does it tell us about attitudes towards relationships between humans and non-humans, or the concept of animal rights? What of ideas of feminine propriety in the context of attitudes of the time? Is it significant that a man was invited two decades later to provide a scientific and rationalist analysis? Is there anything that can be gleaned about the arrogance of colonial attitudes? Merely accounting for local history or lore does not necessarily reveal the multiple vectors of race, gender, technology or ecology that all converge on this moment at this geographical site. Further, the story is contested. The feeding of dolphins a factor in why dolphins visit Bunbury, there are other factors. Many dolphins visit regularly and do not receive any fish, thriving only it seems on human connection. Other versions of the story favour a narrative of psychological/psychic connection between dolphins and the people of Bunbury. The story is a growing, changing, conflicted cultural artefact, just like the city it helps define. The tale of dolphins coming to Bunbury is a staple in the contemporary oral tradition of the town. In telling the story, people construct a civic identity, and connection to the incident helps constitute one’s identity as a member of that place. But the relationship works both ways. The story sustains the identity of its place of origin. In this sense, a city is not so much a place as a set of stories that negotiate relationships between people, places and politics. The works in this exhibition are such stories. Mark Parfitt’s work Oasis Drive continues on from his 2015 exhibition, A Plan for the Summer, and more broadly from his sustained practice of aestheticizing everyday experience. These are documentary artworks, tracking the artist’s social encounters as he swims in the backyard pools of strangers. It echoes the plot of John Cheever’s short story The Swimmer, where the protagonist returns home via a river of swimming pools. This work invests in a socially constructed idea of civic identity, opening the project of definition to local participation. Parfitt’s work is both performative and participatory; it can be adapted to new places and circulate across wide populations. It recognises that a city is a social construction that is continually shaped by the practices of its inhabitants. This work evokes the image of a landscape in motion: fluid and mutable. For the artist, Bunbury is a dynamic, transforming landscape. In conversations leading up to the exhibition, Parfitt spoke of a new personal attitude towards the town following his swim back to Bunbury and a desire to further investigate what might have changed since he was at high school here. His interest is a reminder that these artists are not anthropologists in the field, or impartial empirical analysts, but stakeholders with both rational and affective investments in the fortunes of this city. Grace Gammage straddles the line between disinterested outsider and passionate advocate. Her practice has taken her from Perth to Istanbul to Hobart, Tasmania. In these places, she listens and watches, turning an anthropological eye towards the people of these cities. She has a keen sense of the injustices of the world – those destructive practices fuelled by short sightedness and greed. Her work resolves the apparently conflicting objectives of dealing with questions of cultural politics on broad geographical scales and representing the local in careful and attentive detail. She both respects the local populace, and implicates it in a critique of society and culture. Pidgeon Workshop with Greg is a video tutorial on keeping homing pigeons for use in long-distance communication, which blends informational documentary, lo-fi oral history, poetry, social criticism and performance. It is at first glance a gentle interview with a genial “character”; however, as part of her series Skills for the Apocalypse it invites the viewer to cast a critical eye on those people preparing for the end of the world, as well as contemplate what might bring this about. More than any other work in this exhibition, Pidgeon Workshop with Greg has at its heart the creative negotiation of geographical displacement, which Nicolas Bourriaud endorses as a principle feature of contemporary art. Francis Alÿs spoke of the artist as “a passer-by, constantly trying to situate [him/herself] in a moving environment.” Like Alÿs, Gammage presents a fragment of a place: an impression of a person, a momentary connection across a fragile telephone line. Her work acknowledges how every detail of a place reflects and generates memory and knowledge about nature and culture, something Lucy Lippard calls “art of place”, rather than “art about place”. Caroline J Dale’s work responds to the challenge to represent place in a more complex and more volitional way. Dale speaks of her youth in Bunbury as a time of storming, of boiling rage. “I hadn’t worked out how to write songs, or play guitar, or draw, or do any of the things that buy me a comfortable degree of sanity now”, she explains. Her work in this exhibition is an exercise in rehabilitation and restoration, an assertion of existence against the idea of a monolithically oppressive place. In her work, Dale makes reference to personal history, as well as some of the distinctive landmarks of Bunbury. She weaves these familiar markers between and behind sea creatures in a way that seems to deny their implication in place. A Drive In Cinema, centres around Bunbury’s port, with glimpses of the famed timber jetty and the grain silos, which were demolished in 1992 (Dale was one of many in the huge crowds who surrounded the Outer Harbour on that day to watch the event). The title promises a place of familiarity; however, Dale’s work does not provide easy entry to a commodified version of place. It first promises, then denies touristic access to outsiders. Her works are all figures and no ground: structures are impossibly melded with sea creatures, intertwined in the many strands of place that converge in these images. The morass asserts place as a complex matrix of voices, lives and experiences. Bunbury’s port is itself a kind of metonymy for the connections between the city and the rest of the world. Bunbury and its port lie at the original mouth of the Preston River and near the mouth of the Collie River at the southern end of the Leschenault Inlet. These rivers wind their way north and east through towns like Donnybrook and Boyanup, Burekup and Collie. In the past, timber logs would be floated down the Collie River to be loaded aboard ships headed to the Northern Hemisphere or to South Africa where the hardwood timbers were used for railway sleepers. In this sense the city is a portal, a point of connection rather than disconnection. In some ways this status continues by car and truck today, with Bunbury as the first town of any size drivers encounter as they head south from Perth. However, the evolution of this modern network of roadways shows the role of place in the operations of power. Disconnected from local concerns, people’s energies are channelled down the Forrest Highway, away from communities into a centralised “holiday region”. Danni McGrath’s work focuses on the passenger’s experience of networks and roads. It does not focus on the flowing Forrest Highway but rather is local and wandering, tracking her childhood journey between Busselton and Bunbury through local landmarks. By supplanting the idea of the road as single axis of motion with this more interconnected model, her work can again be read as challenge to the idea of place having an autonomous, essential character. Nostalgia Trip is in some senses a map, plotting the course between the artist’s mailbox and Bunbury Tower. However, like Michael de Certeau’s The Practice of Everyday Life, McGrath’s wandering is a resistant, elusive practice, and diametrically opposed to the scientific objective language of cartographers. McGrath’s road is like Foucault’s heterotopia: a space with more layers of meaning or relationships than immediately meet the eye. Her work rejects the idea of the linear, predictable city in favour of a landscape defined by personal moments. Dionne Hooyberg, like Dale and McGrath, seizes on recognizable landmarks of Bunbury in her work Light Entertainment, borrowing aspects of the interior decoration and architecture of The Lord Forrest Hotel and Bunbury Tower (or “The Milk Carton”). These buildings are typical images of Bunbury, regional stereotypes in the same manner as dolphins have come to be. Again, these typical icons can grow to occlude important cultural conflicts and political struggles that tie regional cities to a wider socio-political history. Hooyberg’s interest in the Milk Carton stems from her work on the iconography associated with Alan Bond. Bond, known for his high-profile business dealings, resulting in the biggest corporate collapse in Australian history and criminal conviction, was responsible for building the Milk Carton in 1983. Rising far above the other buildings of the CBD, it is obnoxious and optimistic – one of the clearest remnants of the excess of the 80s, which ended in recession and the slump of industry in Bunbury. It can be seen that the very images that delimit and disconnect places can be sites for local public discourse or self-reflection. In re-examining these places, we can discern the dynamic interconnections between Bunbury and the rest of Western Australia and the world. Hooyberg’s work is also personal. It speaks of the etymological roots of nostalgia: from the two Greek root words nostos (return home) and algos (pain). For Hooyberg, the landmarks of Bunbury are a symbol of a more hopeful time, and a sign on the horizon that marks the pain of returning home. Similarly, Gemma Weston’s work centres on a border-marker of sorts. Three Stories About Mixed Messages is a piece of writing that speaks in part about “an object that stands near my childhood home, and which had been on my mind– a two-man tall white steel tower topped by an orange triangle fitted at the centre with a bright fluorescent bulb, like a blind illuminati eye.” This tower represents a border-crossing into and out of Bunbury, limited though it is to one person’s family geography. It might be argued that Bunbury is a geographic reality, a location on the map with fixed borders, and its boundaries do not thus shift with the perspectives of subject. However, this would be a simplistic definition. It should not be forgotten that the land on which Weston’s tower stands was once underwater. Beneath those sands are sunken ships and graveyards which maps do not admit as a past or present reality. Weston’s work has developed since she first wrote the text in 2012. It has become less about borders and boundaries, and more about relationships. This comes with the inclusion of a postcard from Weston to her mother, apologising for miscasting her mother’s role in the original story. Place can be expressed simply as the address on a postcard when you are away from home. That which opposes a sense of displacement is not so much place as it is family. That is to say, family is often the medium that constructs the experience of place. Weston makes apparent the complicated and ambivalent nature of family ties in her work. The networks of forces that interconnect to make a place for her in the world are made visible. This reinforces the primary thesis of this exhibition. Places are not things to be found out in the world, they are ideas about spaces that are constructed by people, in acts of observation and interpretation and making. A city is not a geographically bounded slice of terrain, but a way of describing relationships. From Roberts’ generation of impressionists, who sought to capture “only as much as we feel sure of seeing,"  the next urge of artists was moral: how does a place influence people, and how, in their turn, do people make their marks upon a place? Sidney Nolan scorned the Heidelberg School’s “sitting in the sun”, instead seeking through his art “the constant beneath". Along with Russell Drysdale and Fred Williams, Nolan’s descriptions of the desert interior and dry scrub of Australia became a deep part of the national consciousness. Now, Susan Ecker, three decades into her career, shows that painting the landscape remains a vital and powerful force in Australian art. Ecker first came to Western Australia from her native New York in 1996. Having long practiced as a painter, she, like Guy Grey-Smith, Margaret Preston and Elise Blumann before her, was immediately captivated by the challenge of representing the local landscape. Her second Australian exhibition in 1999, Drawn to New Light, drew praise for “coming to grips with an environment that must be very different[…] she captures both extremes of Australia – her small works are strong and emotive, while the large works are light and airy." In 2010 Ecker settled permanently in Donnybrook and set to working on the body of paintings and prints in Elemental Space/Elusive Place. These works are all landscapes of the South West, made in the past few years. The paintings are rigorously considered, from the size of their canvasses to their internal geometries and scrupulous colour relationships. 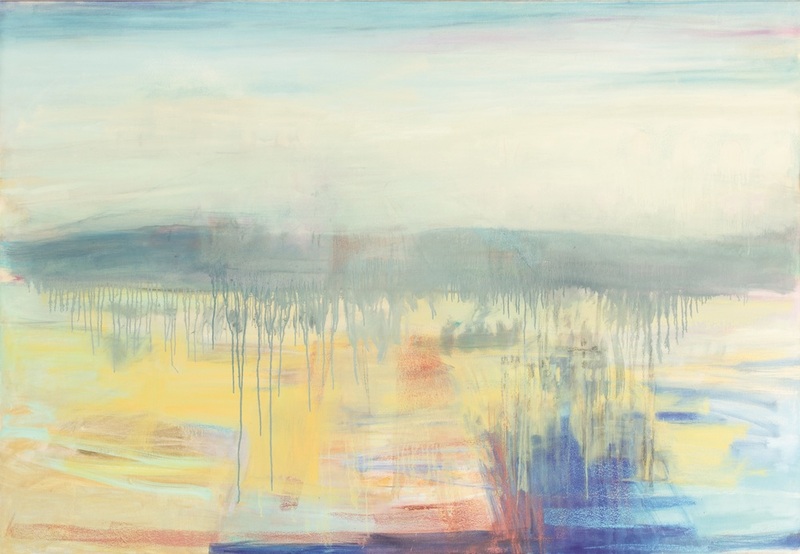 Her works evoke mood and memory as much as specific topography. Passing time, changing light, gradations of temperature, dampness in the air and texture underfoot animate her paintings. In this way, the enquiries of her art are subtler than those that have gone before. Rather than simple matter, her paintings are more about air. They have as much a sense of pause as of movement, and they collapse the distinction between space and time. They compel the viewer to consider the spiritual and emotional qualities of the landscape, and its ongoing power to shape people. As an exhibition, Elemental Space/Elusive Place presents a concentrated experience of place, yielding an expression of its essential spirit. Western Australia’s South West cultivates hardy survivors. Confronted with dry, leached soils and deeply weathered slopes, many South West plants have refined their ability to access water and nutrients. Emblematic of this region is the furrow-trunked Jarrah tree. The network of mill towns in this area – Dwellingup, Harvey, Collie, Kirup, Bridgetown – are testimony to 150 years of aggressive timber harvesting that claimed the majority of the mature trees. Nevertheless, the forests are still plentiful, and the most distinctive part of this place. Jarrah trees have adapted to millions of years of climatic hardship by adapting their root structure, developing a downward tap-root that burrows as far as the trunk grows upwards, able to reach the water table up to 40 metres deep. It is the image of the tap-root that strikes me when I look at Scarp-Winter/Cobalt-Jarrah. In this work, Ecker expresses the fundamental elements of the landscape through rhythmic patterns, with the textured surface creating descriptive detail and nuance in abstraction. Colour is used in a highly expressive manner, with the harmonious combination of dark blues against orange-gold conveying a richness of atmosphere and a distinct sense of weather encroaching. This painting brings to words of Noongar elder Noel Nannup who said that when it rains, the spirit of his people is swept from the body and runs down to the catchment bowls of their birth. In hinting at moisture, at the trickling wetness at the depths of the earth and the louring presence at the horizon, this work inserts itself down hard and deep in the mind, like the tap-root of a tree that shows no signs of withering away. Susan Ecker’s paintings seek the immutable quality of landscape, reducing it to simple elements to which viewers respond immediately and emotionally. In doing so, she creates paintings that impress themselves deeply on the mind. Summer Light presents a striking combination of blues and greys of foliage set against lavender, yellow, blue and red of the background. The features of the scene slip and resist the imposition of definite labels. What could be wetlands resolves in another moment into the ghost of a track winding through a paddock. Trees rise up on the horizon then shrink down to mere shrubs on a hillock. The threshold between fixed identifications in Ecker’s work creates a liminal space. It opens up the possibility of a cultural hybridity that entertains difference without an assumed or imposed hierarchy. Instability is a persistent theme in the landscape of our coastal plains, with lakes, dunes and woodlands increasingly squeezed between the spreading conurbation of Perth and Mandurah and the filling coast near Bunbury, all scored through by the straight line of the Forrest Highway. Scarp-Winter/Cobalt-Yellow seems to express the conditional nature of our settlement, the permeability of this land. The shimmering horizon appears to slip and crawl in the heat of the day. The Perth modernist painter Elise Blumann spoke of how “in [her] effort to give a feeling of sharp flatness” she would “force [her] compositions with as much solid light as possible". In this painting, bands of vivid colour suggest the flattening effects of the Western Australian light, and give expression to the broad expanses of hills, sky, foliage and earth. The distant rise of the backdrop trembles and spasms, as if threatening to foreground itself. The fizzing landscape resists any attempt to impose control – it expresses an organic, material reality that is bigger and more complex than our selves and our mean carryings on. Rather than painting in the open air like her Heidelberg School forebears, Susan Ecker works from the studio. As she works, she draws from accumulated memory, as well as directly from the view of the Donnybrook hills spilling in every direction outside her window. Working in this way, her paintings could be considered pastoral scenes, but they exceed the conventions of that genre. We see this in works like Scarp-Dusk/Gray-Light Earth-Yellow, which has none of the ordinary bucolic neatness of enclosure. The treatment of space in this work gives a particularly vibrant and energetic quality to the painting. The painting presents sky, distant hills and rows of trees through flat blocks of neutral colour, with hatched striations suggesting a densely detailed canopy. The flats of the mid-ground are shown as a band of greens and yellows, and a more muted lavender interrupts top half of the picture, indicated depth and shadow in this more wooded area of the landscape. Where the picturesque tradition of painting might suggest receding space through subtle atmospherics, the clear dry air of Western Australia precludes this possibility. Instead, in Scarp-Dusk/Gray-Light Earth-Yellow, stalks of grass or shrub act as significant markers leading the eye across the image. There is an expansive quality to the elements of the landscape, and they can be imagined extending outwards beyond the picture plane. Ecker does not put a boundary on the landscape, which would mark it as a settled, cultivated space, but rather argues that we cannot have dominion over the land. Instead, we must work to create symbiosis with the land, and accept and appreciate its power over us and our imaginations. In his book Landscape and Memory, Simon Schama says, “it is our shaping perception that makes the difference between raw matter and landscape”. It is the artist who brings meaning to inert trees, rivers and rocks. We construct the landscape, and the way we construct it reflects who we are. After the rupture of colonialism, place became an issue with the language of art itself – a lack of fit between the place experienced and the description painting allows. Susan Ecker uses colour, form and linear dynamism to develop a new lexicon that reintegrates ‘space’ with ‘place’. Her work shows this land not as an empty space, but as something in constant flux, a discourse in process. Here at Bunbury Regional Art Galleries, we are just ten minutes walk from a wooden boardwalk, which snakes its way through salt marshes and tide-washed thickets of White Mangrove trees. These mangroves are remarkable because of their rarity – outside of this immediate area, the nearest mangroves of this sort grow hundreds of kilometres north on the Abrolhos Islands. The seeds of the plants that grow here today floated down the Western Australian coast from warmer northern waters and lodged in the silt of the Leschenault Estuary thousands of years ago. To draw again on the symbolism of the south west’s biodiversity, I am reminded that we are all strangers to this land, and arriving here has transformed us. Those who came in ancient times learned to treat the land as an extension of their own being, expressing that in some sense they did not own the land, but rather were owned by it. We more recent arrivals soon learn the power that the land has to move us, to force us into unfamiliar postures. This continent is fierce and it is uncompromising. The sense of volatility we perceive in the Australian landscape is unlikely to disappear, even as we spread across the plains, as extremes of weather become more commonplace. We see evidence of this in our recent history. The Waroona bushfires burned through an area of land larger than 71,000 hectares, destroying almost the entire town of Yarloop, and licking at the outskirts of the major populated areas outside Bunbury. Our “land that drinks the sea” is drought-weakened and heavily reliant on desalination plants for fresh water. Interaction with nature is a crucial and pressing aspect of Australian life. In his seminal 1977 text on the Swan Coastal Plain, George Seddon said, “how and what we see depends on what we value […] to see differently is to behave differently". By treating landscape as a worthy subject, artists like Ecker remind us to treasure the land, and to recognise the chance we have to defend it. The evolution of representations of landscape in art as expressed in this essay follows a model proposed by B Elliott in The Landscape of Australian Poetry, Cheshire, 1967. J Clark and B Whitelaw, Golden summers, Heidelberg and beyond, International Cultural Corporation of Australia, 1985. He was, of course, unfamiliar with the long tradition of Aboriginal art and its predication on the landscape. T Roberts, A Streeton, C Conder, “Concerning Impressions in Painting”, The Argus, 3 September 1889. R Haese, Sidney Nolan: The City and the Plain, National Gallery of Victoria, 1983. N Nannup in conversation with R Little and V Laurie at Perth Writers Festival 2016. "I’ve just woken up, my eyes are still full of sleep, but I am perfectly aware that this gesture I’m performing to start my day is a decisive and solemn act, one that puts me in touch with both culture and nature together, with thousands of years of human civilization and with the birth pains of those geological eras that gave our planet its shape." Calvino’s words in The Call of the Water fittingly frame the ritual of taking a cup of tea, as it is cast in this exhibition. While Calvino’s text spoke of bathing, his words seem to perfectly express the sublime paradox that shapes Claire Pendrigh’s work in Tea Seas: that is, the discovery of the lastingly monumentous in the fluid and transitory, the elusive and diaphanous. Tea Seas is made up of paintings, drawing and animation created during Pendrigh’s residency at Studio Kura in Itoshima, Japan. In Japan, more so than Pendrigh’s home of Bunbury, water is at the heart of life. Visits to the onsen, the public bath house, are considered of social importance and this, as well as the ritualized, secular practice of the tea ceremony, is symbolic of a shared intimacy with water. The starting point of Pendrigh’s work is the function of tea in society, its role in hospitality, community and social ritual. The central series of works in the exhibition are the Tea Seaspaintings. These long scrolls of paper hang like sentinels in the gallery, each bearing a circular whorl of colour – plum, pink orange and vermillion discs, which seem to ripple from the surface of the painting. The paintings depict a cup of tea as seen from directly above, though with a scale and gravitas that imbues them with a greater sense of powerful cosmological forces. We are reminded that the hydrogen and oxygen atoms that make up the water in a cup of tea was formed in interstellar gas clouds and delivered to Earth 4.4 billion years ago. For the most part, the water we drink and the vapour we breathe is the same water that sustained ecosystems on this planet since the origin of life. If we could read the encoding of cells in a cup of tea, its water could act as a palimpsestic archive of history. The paintings are executed in accordance with traditional Japanese artistic techniques and materials, using traditional powdered pigments on rice paper. To create the work required patience, repetition and restraint; the pigments mixed with a water-based binding medium and layered in monochromatic washes to produce subtle gradations of tone, and the hanging scrolls of rice paper subsequently stretched onto rigid panels. From these repetitive processes, so intertwined with and sensitive to the presence of water, patterns and visible regularities arise, reminiscent of forms in the natural world. Pendrigh’s paintings of teacups remind us of undulating oceans, geographic formations and the foaming patterns of living cells. To make explicit this connection, in 24 Cups of Tea, Pendrigh has scored spiralled lines onto wheels of colour to mimic the shape of proto-cells, the theoretical stepping stones to life. Her Split/Pour drawings show these cells in the mitotic phase – in the process of splitting into two daughter cells. It is from chaotic systems that patterns arise in nature: from zigzagging patterns of whirling vortices resulting from the unsteady separation of flow of a liquid, to complex structures arising from simple cells. This idea of spontaneous order forming from chaos lays the foundation for Pendrigh’s work Abiogenesis. This simple animation refers to the theory of the origin of life whereby living organisms formed from inert organic compounds. In the animation cups of tea transform: from limpid pools, to simple cellular structures, to Japanese kaomoji – simplified faces made up of characters and punctuation. Between the Tea Seas paintings and Abiogenesis, this exhibition creates a productive tension between the two ways in which we perceive water. In the first sense we recognise water as constant and resilient; a colourless liquid with no form of its own but taking the form of its container. From the blood of dinosaurs to the cup of tea in our hands, Tea Seas describes water as an ancient and immutable liquid, unchanging throughout history. In 1964 Bruce Brown produced the definitive surf movie: The Endless Summer. The movie follows surfers on their worldwide quest for the perfect wave. It was the first ‘pure’ surfing movie – made by surfers, for surfers – which crossed into the mainstream of popular culture. It marked a cultural moment; surfing became a hot new sport, associated with youthfulness and an ideal Californian lifestyle, and shamelessly exploited by the media. The surfer style and antiestablishment identity became a marketing tool to sell clothing, movies and magazines. Surfing culture spawned a style of art which collapsed boundaries between art and design. Hierarchies became established in the art world and the surfing world: between contemporary and kitsch, between locals and wannabes. Endless Autumn uses humour to explore these divisions in the context of the less desirable aspects of surfing: ‘waxed’ car doors, broken thongs and the great white shark. Confronting the viewer on first entering the gallery, Stalagmite suggests aquatic shapes: gelatinous sea creatures, the accretion of salt on handrails near the beach, or the sea itself as it swells to a curling abstraction of a breaking wave. Its phallic symbolism punctures notions of the heroic male artist, an idea underscored by the collective nature of the exhibition –Attwood and Hull share authorship of all the works. Machismo and surf-wax recur in Waxed Again, a work alluding to the practice of local surfers destroying the car doors of out-of-towners. Surfers speak of ‘localism’, being the extent to which surfers mark out their territory using violence and intimidation. Although surfer Tom Trigwell recalls that in the 1960s a certain break was known as ‘Bunbury Break’ in recognition of the number of surfers who made their way down from the regional centre, the waves of the south west now have some reputation as ‘localised’. 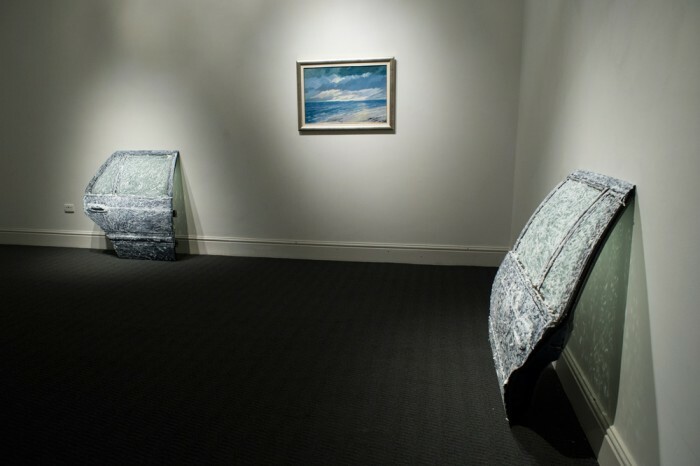 The two waxed car doors are paired with two paintings of local beach landscapes from the City of Bunbury Art Collection. The inclusion of these works again raises questions of collective authorship of an exhibition, but also provokes viewers to question the forces that determine the course of art scholarship. Just as typical Surf Art incurs the disparagement of the art world, this disdain is echoed by the hierarchy of genres in academic art, with landscape towards the bottom. The question of authenticity and acceptance runs parallel in art as in surfing. Anti-Shark Abstraction serves up the hard-edged painting style of West Coast geometric abstract painting, in this instance representing the shark-repellent patterning of surfboards and wetsuits. The intense colour and bold unitary forms draws on the human fascination with machine-made uniformity and standardised experiences as contrasted with the thrilling unpredictability of natural phenomena. Blue Tube, an air-conditioning vent painted the colour of Bunbury seas invests a quotidian object with the mystique of the perfect tube. The item is offered as an object of obsession – the hovering mirage a surfer might see if stranded in an art gallery in a town with no waves. This all-too perfect tube can be seen as commentary on the increasing popularity of surfing amongst the general populace, where surfing is compartmentalised and packaged for a mass audience. Similarly, Freddo pokes fun at the ubiquitous surfing imagery in mass culture. Along with Blowout, it speaks to the hybridity of Australian culture – appropriating American styles of footwear (made in Brazil) and presenting a British candy as a mark of Australian identity. The exhibition as a whole plays on the motif of provincialism in its repeated allusion to the benchmarks of international modernism, referencing Duchamp’s readymade, the monochrome paintings of modernism and the mass cultural references of pop. However, in this instance, the artists engage with modernism to entrench themselves all the more firmly in the regional. Their artworks locate themselves firmly in this specific site, thus anchoring the hybrid, unstable identities of postmodernism firmly in the complex histories, practices and identities of this region. 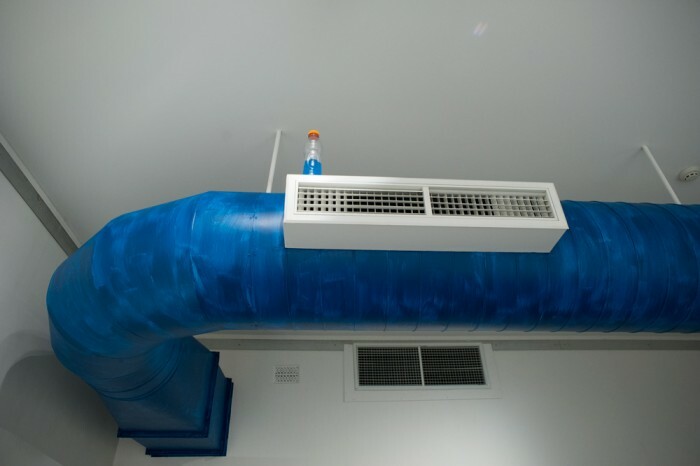 Blue Tube, 2015, acrylic paint, air-conditioning unit, Gatorade Blue Bolt.